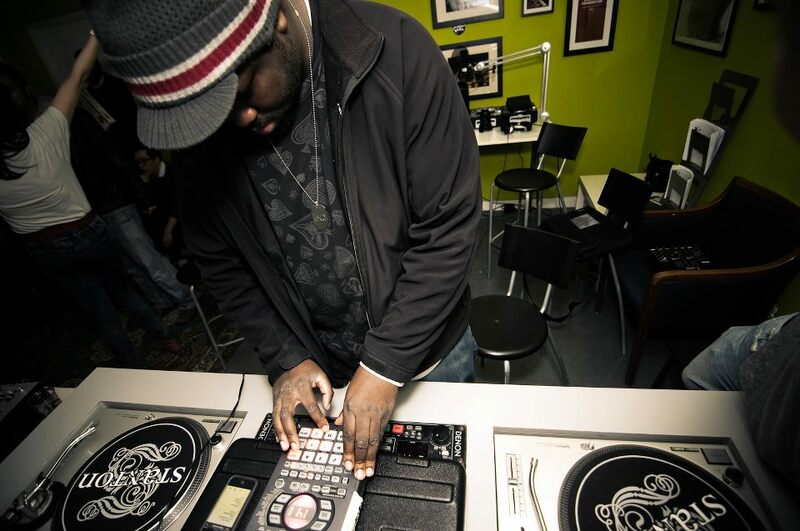 Guelph Ontario’s Elaquent is one of the most respected DJs / Beatmakers around. From releasing his own stuff, to making beats for great acts, to opening for industry titans (Talib Kweli, anyone? ), Elaquent rocks it all. He is also one of the few DJs that will get other musicians really excited about shows. Even a mid-week show. Not only is he really talented, and respected by musicians and fans alike, Elaquent (or eQ) is a really nice guy. We caught up this week as he prepares to open up for Slum Village. Find all the details for the show, here. Q – We are really excited to have you back in Hamilton this week. I’ve read a lot about how you mention J Dilla as a huge inspiration for you, what’s it like knowing you will get to open up for Slum Village this week? You’ve opened for a lot of legendary hip hop acts – it must be wild. What is that like for you? Much love, it’s always nice to be out in the Steel City. As for the show, yeah it is pretty humbling. I mean, everybody grew up on 90’s hip hop and Slum Village definitely had a strong influence on the way I go about music. I guess it hasn’t really sunk in yet, but ultimately, I’m more looking forward to just seeing Slum put it down as a fan, everybody from the D always put on good shows. Real real excited for real. Q – Where do you find most of the samples you work with these days? Do you dig through crates, or scour the internet. Is it a combination? I get sounds from any and everywhere. I’ll sample from records, or off the internet. It doesn’t matter to me, as long as it sounds good at the end of the day. I don’t really have a particular preference or anything, it is pretty random i guess. Q – You’ve spoken before about how instrumental Myspace was for you, when you began your career. It was a turning point for music and music fans, in my opinon. Social media has changed and grown a lot since then – what’s been the most rewarding platform for you, since myspace? Since myspace, it has definitely been Soundcloud and Twitter. Facebook is starting to get a little wack, although I’m still pretty active on it. Soundcloud is definitely my favourite, it focuses just on the music and is an easy way to stay in tune with what all the homies are doing. Bandcamp is also pretty pivotal and has really made it nice and easy to sell music online. The internet is a beautiful thing (haha). Q – What advice do you have for people looking to start making their own beats? What software / hardware is best for beginners? Any thoughts on that? The only advice I’d give to an aspiring producer or DJ is to be patient. The vast majority of artists are not going to master their craft overnight, and not everybody will find mainstream success overnight. You’ve just gotta stay patient and diligent. As far as software, I’ve always found fl studio easy to learn and get into, but ableton seems to be the popular choice for it. I’d encourage anybody to experiment and find something that they’re most comfortable with, no program is better than another in my opinion. Q – You are one of our Canadian gems that is well known and respected overseas – sometimes more so than here. As a musician, what do you think is up with that? What is it about us, as Canadians, that lets us sleep on incredible talent in our backyards. I don’t think its primarily a Canadian thing. I’m friends with quite a few musicians from Australia, France, Germany, all over the place that tell me all the time that they get more attention outside of their own home country. I think its simply taking your homegrown talent for granted. It seems like sometimes it takes somebody else showing interest before you realize what you have.It’s kind of like how, for example, the Houston Rockets had Jeremy Lin on the bench and cut him from the team, only to watch him have that crazy run in New York before they realized that dude should have been playing. You never really hear about many Canadian artists who get a lot of attention before finding success in the US, its always the other way around. It almost feels like we, as fans, need to see an artist prosper elsewhere before we can appreciate what we have. Q – I know that you are a big Kung-Fu fan – which Kung Fu movie has the best soundtrack, speaking as a beat master mind? Definitely Bruce Lee’s movie Big Boss. That one was the most memorable for me. Chen Kuan Tai’s 1977 Iron Monkey movie had a dope soundtrack too. I mean, lots of those 70’s flicks had soundtracks that were actually jacked from Spaghetti Westerns haha, oh well. Q – What did you make of RZA’s “Man with the Iron Fist” – as a kung fu fan and a RZA fan, what did you think? Believe it or not, I havent seen it yet. The thing is, I’m a real serious martial arts movie fan, and I had a bad feeling about that movie, the wires and a few things kind of put me off, but I”ll reserve judgement for when I see it. It’s amazing that RZA directed one, knowing how big a fan he is. Q – What are you listening to these days, can you recommend a track for us to check out? I’m a big fan of Sunclef, he has this crazy Raise it Up flip that i got stuck in my head.